153 YEARS AGO a horse and buckboard saw you to town, your word meant everything, and the world was still understandable and full of promise. Step back in time by surrounding yourself with old west frontier and Victorian clothing that'll make you feel like you've left the modern world behind. 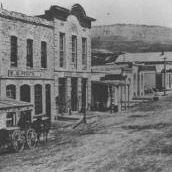 In 1864, Ranks Mercantile, in Virginia City, Montana, sold everything needed to outfit cowboys, miners, respectable (and a few not so respectable) women, and would-be soldiers off to fight in the Civil War. Thankfully, the shelves haven't changed all that much over the last century or two.